I am currently working on long-term tourism development projects, mainly as a trail development specialist and ecotourism expert. I’ve worked on creation of hiking and mountain biking trails in a number of Protected Areas in Armenia. Currently, I am working on transboundary tourism packages and tourism management in protected areas. 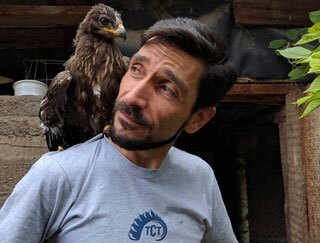 I am also involved with the Transcaucasian Trail international team as a Trail Development & Partnerships specialist. I love hiking, cycling, yoga and arts. I often get 1-day or multi-day hiking orders from big and small groups of local and foreign travelers, so I started my own tour company, which is called Thyme Travel Armenia. My wife and I are working on it together, often guiding together as well. I do pottery when I have the chance for it, and I am a big fan of eco-buildings, especially strawbale and clay combination. I love sharing my culture with outsiders and traveling, so I can get to know other cultures. Shengavit – A 6000-year-old town in Yerevan!